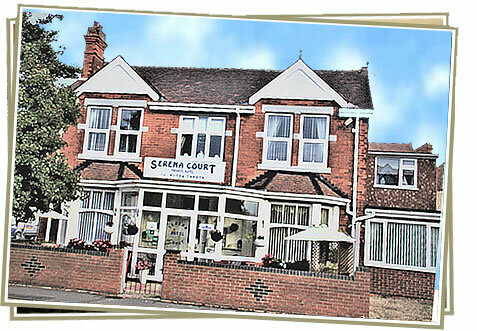 Serena Court Hotel, Skegness, Lincolnshire, UK, bed and breakfast. Terms and Condtions. No deposits can be refunded due to administration and re-advertising costs. If cancelled within 24 hours of check in time 100% of total cost of stay is required. If cancelled within 7 days = deposit + 40% of total cost of stay is required. If cancelled within 21 days = deposit + 20% of total cost of stay is required. If cancelled with more than 21 days notice = deposit only is required. We recommend travel insurance is arranged to cover any losses. customers are welcome to drop off luggage with us. We will store luggage safely and take it to your room as soon as the room becomes available. This means no smoking is permitted anywhere inside the building. This includes en-suites and the downstairs toilets. Smoking is not permitted inside the front porch. Smoking is not permitted out of the windows. Rooms are to be left as you would wish to find them. It is not permitted to bring take-away food into the bedrooms. Large items such as shoe boxes or toy packaging must be taken with you. We are a licensed premises establishment we can no longer allow drinks purchased elsewhere to be consumed on the premises. © Copyright Skegness on the Internet & Serena Court Hotel. All Rights Reserved.